Montessori’s goals for children are often in alignment with a parent’s own goals for their children: that children respect and care for the people and things around them, have fun while they learn, and take responsibility for their actions. The Montessori method is an approach to childhood education devised by Maria Montessori (the first Italian woman to obtain a medical degree). In a marked departure from traditional teaching methods, Montessori advocates following the child rather than leading him. 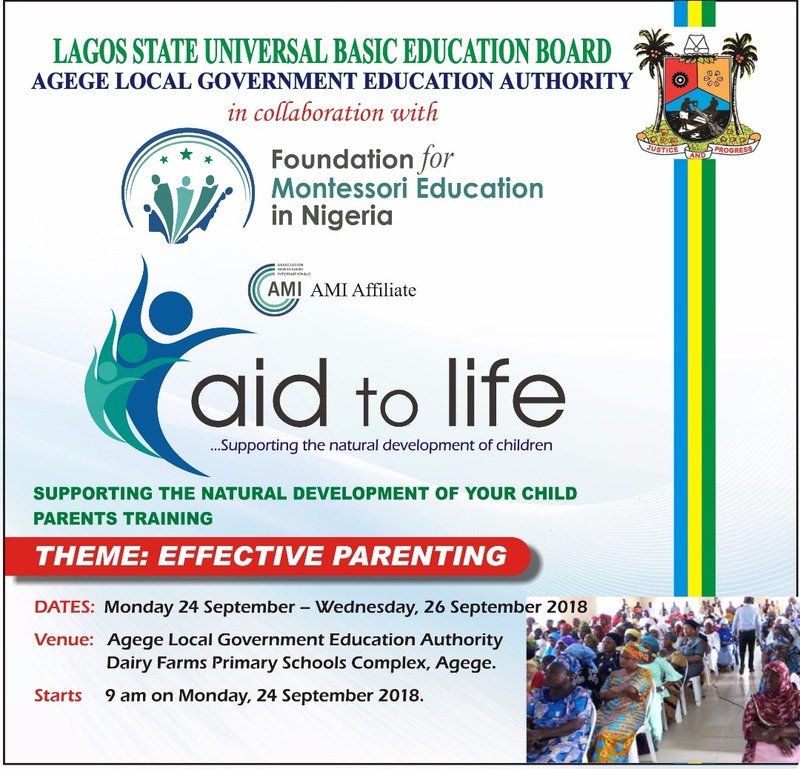 The approach is based upon the premise that the child has an inborn desire and capability to fulfill his own developmental needs and the adult/educator’s role is to support this developmental work. To harness the child’s natural abilities and provide concrete experiences and materials, when the child is most motivated and interested, towards attaining independence, intellectually and physically. The classroom acts as a “mini society” whereby younger children learn from watching the older children and the older ones reinforces the skills they learn by helping the younger ones. Hence, all the children are encouraged to develop intellectually, socially and emotionally. Montessori classes that do not exhibit this mixed grouping are missing an important part of the Montessori approach. What is the Montessori Curriculum? Practical Life – enables children to practice the skills of everyday life while developing concentration and co-ordination of mind and body. There is a three-hour work cycle within which there are no set timetables. Children progress naturally and gradually through activities in a specially prepared environment within which activity prepares them for a later one, guided and directed by a trained adult. How to recognize a true Montessori School? A mini society whereby younger children learn from watching the older children reinforce the skills they have learnt by helping younger ones. 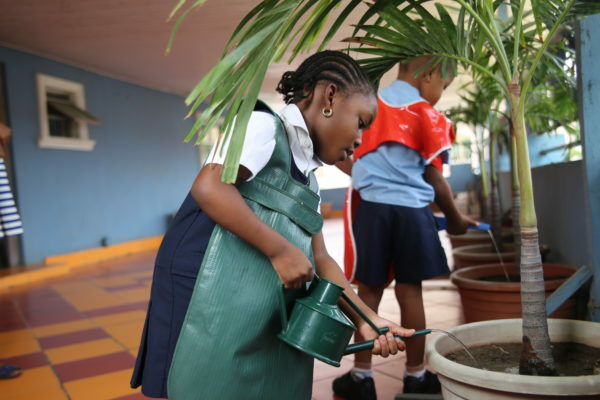 School should offer children more than just academic skills. It should help them grow into confident, independent, caring and self-motivated people. The goal of Montessori education is to develop the whole person; someone who is more than the sum of their test scores. Equally important to the Montessori experience is the growth of the child’s character. 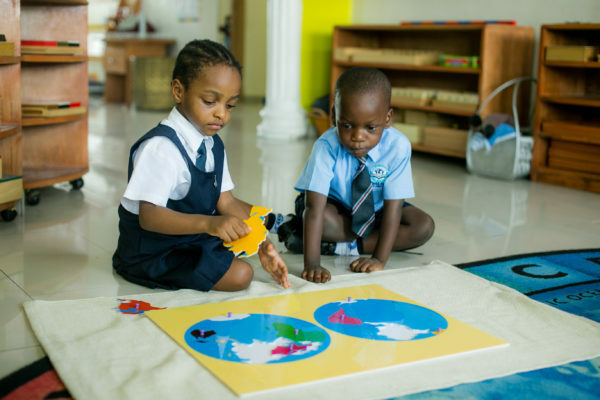 Montessori teachers strive to engender in the child a sense of responsibility and the connectedness of people and things. Children learn that their choices have consequences, not only in their immediate interpersonal relationships, but also in the world at large. By allowing safe consequences to flow freely from the child’s choice, he learns to exert control over himself to limit negative results and promote positive ones. This development of executive function, most particularly self-regulation, is at the core of the child’s drive towards confidence and independence. In Montessori classrooms, academic skills are integrated into the natural life of the classroom. 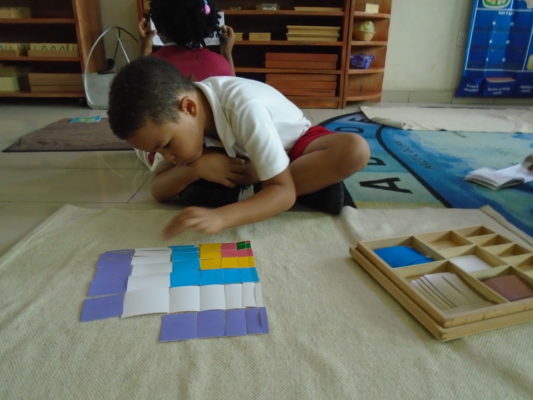 Through hands-on play, the most basic foundations of mathematics and literacy are introduced through games, activities, and with special materials that appeal to children. 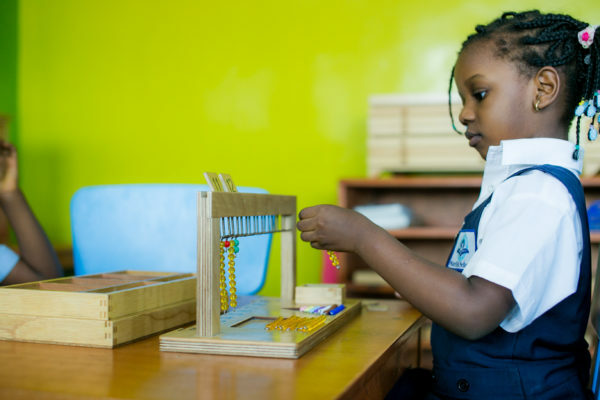 Contrary to many adults’ schooling experiences, children in Montessori schools enjoy math, reading and writing, and enthusiastically look forward to their next lesson. This sets up a love of learning that the child will carry with her throughout life. Understanding children’s developmental needs is important in creating positive parent/child relationships. Children, especially very young ones, are intensely driven by their developmental needs, which can sometimes clash with the needs of parents and caregivers. By understanding the child’s drive towards independence, we learn to offer her the time and skills she needs to complete the task herself. The intense effort she puts into small, repetitive tasks is deeply satisfying, and the end result gives her confidence and comfort in her skills. If she is not allowed to work through the task to completion, the child may react strongly. This kind of opposition, originated in the conflicting needs of the adult and the child, highlights one of the main obstacles to a harmonious relationship between adults and children. 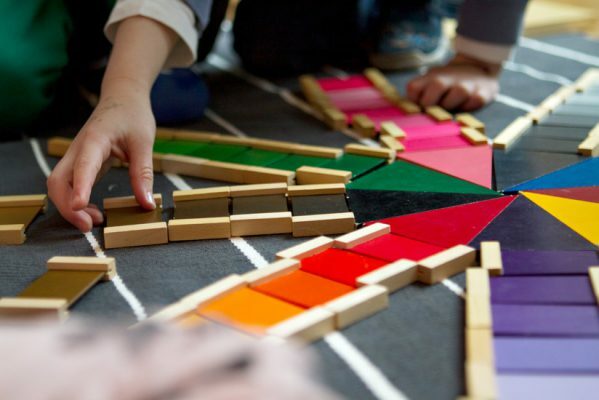 One of the key tenets of Montessori theory is that this harmonious relationship can be achieved through understanding why children act the way they do, and by patiently offering them experiences that fulfill their deep, inner developmental drives. The entire Montessori environment is designed to meet these drives and satisfy them through the child’s own activity. In Montessori schools, children have fun while they learn, respect and care for the people and things around them, and take responsibility for their actions. This is true preparation for real life. 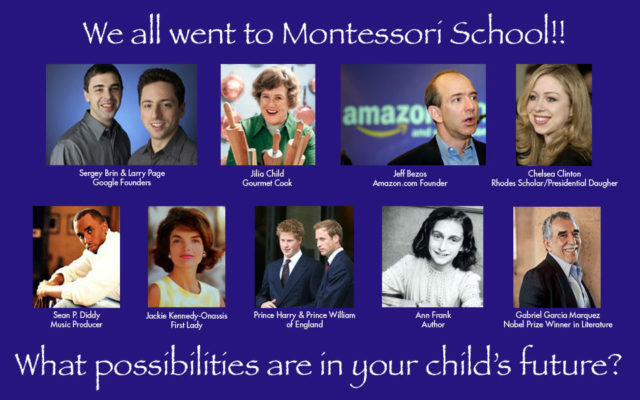 It is quite an interesting collection of people throughout history who have gone to Montessori schools, sent their children to Montessori schools, or supported this method of education in one way or another.